It has been nearly a year since JE Design released the Audi Q7 Widebody featuring a power boost for the 3.0 V6 TDI engine from 171 kW/233 bhp and 500 Nm to 210 kW/285 bhp and 550 Nm. Now the Volkswagen, Audi and Seat tuning specialists have boosted the 4.2-litre V8. The regular Audi Q7 4.2-litre packs 350 bhp/440 Nm with a top speed of 151mph(243km/h), and a 0-62mph of 7.4. With the help of JE Design, this power is boosted to no less than 500 supercharged horses and 600Nm of torque, top speed rises to an impressive 169mph(271km/h) with 0-62mph achievable in just 5.6 seconds. The supercharger conversion includes a water-cooled intercooler, an exhaust system from the manifold, special forged pistons and modified engine management. 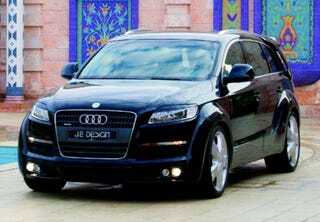 JE DESIGN also takes care to ensure that the Q7 still complies with the emissions regulations. Featuring the Powerful wide body styling kit, the Audi Q7 Widebody is rounded off with an electonically lowered suspension and JE Design rims. 2.3 tons of unladen weight are not that easy to gloss over. With that much weight, every scrap of power and every Newton meter of torque counts. The basic specifications of the 4.2-litre Audi Q7 do indeed make quite an impressive read. After all, 257 kW / 350 bhp, 440 Nm at 3500 rpm, a top speed of 151 mph and 7.4 seconds for the sprint from 0 - 62 mph are not exactly chicken feed. But JE DESIGN turns the Q7 into real high-flyer, with no less than 500 supercharged horses (368 kW) rearing and bucking under the hood. 600 Nm of torque, available at 3,850 rpm, propel this heavyweight from a standstill to 62 mph in just 5.6 seconds. And it does not stop till it reaches an impressive 169 mph. The supercharger conversion includes a water-cooled intercooler, an exhaust system from the manifold, special forged pistons and modified engine management. JE DESIGN also takes care to ensure that the Q7 still complies with the emissions regulations. The conversion also includes TÜV certification.